I went back to explore Portland’s “Trendy-Third” (23rd Ave) area this week. When I had earlier asked for café recommendations, one of my MIM classmates (Badih) recommended the St. Honoré Boulangerie. Had my French been a little better, I would have realized that it was more of a bakery, but since they have coffee available, it’s close enough for me. It was about 1:30 in the afternoon when I arrived. The bakery serves Caffè Umbria coffee and since I had just been to Caffè Umbria two days before, I opted for a single cappuccino ($2.75) instead of ordering the usual espresso. I’m not sure what possessed me to do that, but with all of that foam, a cappuccino is more of a breakfast drink than an afternoon drink. 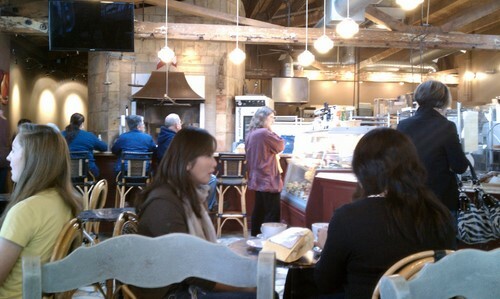 The café itself is a nice space. It has a stone floor and large wooden beams overhead. The bakery area is open and if you want you can sit at the bar next to the large brick oven that is the center of action for the bakery. There are seven small round tables and one long rectangular wooden table that acts as a common table or a place for larger groups to sit. Outside, tables wrap around the café underneath a large awning. St. Honoré is a very busy place. It buzzes with activity behind the counter as well as in the seating area. It is definitely a hipster place too. While I was sitting at the large table in the front of the café, a steady stream of well-dressed patrons strolled in off the street. Not everyone who came in was “cool” like that, but I would say definitely the majority. While St. Honoré is a café, its heart is in the bakery. 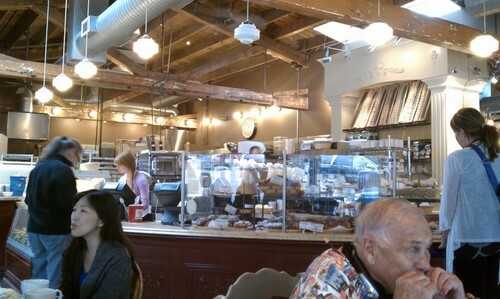 It has a variety of fine looking pastries and several different kinds of breads for sale. Croissants, small fresh-fruit tarts (that look fabulous, for $6.50) and many other things looked delicious. I had to summon up a lot of willpower to not order one of everything. If you’re looking for lunch, the glass case next to the register holds a variety of different sandwiches, and there are a variety of salads available too. As I was sitting at the table, I heard a gentleman next to me discussing the bakery. He had brought a friend who had not been to there before, and he told her that the owner was some type of “master chef baker.” He explained that within the culinary profession there are very few of these in the world, so apparently Portland is pretty lucky to have such a bakery. I ended up leaving left the café with a loaf of bread (the Parisian,$2.80). I would have tried St. Honoré’s signature bread, the Miche Banal, but at $4.95 for half a loaf, I just couldn’t do it. The Parisian was good, but I still think I prefer Grand Central’s bread. If you’re trendy and in-the-know, I recommend that you go check out St. Honoré. If you’re not, the boulangerie is still a good place to go to make yourself feel like a hipster (and get some good bread too). You’re not going to get a single-origin espresso there, but you will get good coffee. Bring a little extra cash so you can splurge on one or two pastries.